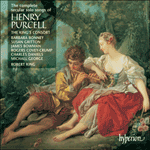 Purcell’s charming setting was printed in 1685 as part of the first book of The Theatre of Music. The poet asks how he can be successful with his shepherdess, for he is, despite all his efforts, being rewarded only with disdain, and is enduring ‘Ten thousand tortures’ whilst ‘Languishing night and day’. In the third verse the poet asks Fate why he is being punished so severely; if he knows, he will repent. But, if it has been resolved that he must suffer this treatment for ever, he asks that she should continue to treat him so and, in breaking his heart, kill him. To heal the wound she gave. What is my crime, oh rigid Fate! And cure by death my pain.